Many times when I speak with people who are just diagnosed with cancer, they want to change their diet immediately. I get it. They want control over something in their life when suddenly everything seems out of control. Everyone else is asking for their time, setting doctors’ appointments, and scheduling imaging and laboratory tests. Cancer survivors may turn to food as something they can control. This isn’t necessarily a bad thing! Healthy, balanced food choices are an important part of any treatment plan, but if you are making changes to your diet, you need to do it the right and safe way. I want to beat cancer. I want to live to see my children grow up and marry. I must be in the best shape to endure my cancer treatments. The goal to live a long, healthy life is a common desire for cancer survivors. Eating fewer calories, saturated fat, and animal fats may be one way to reduce your risk for many chronic diseases, especially inflammation, heart disease, and circulation problems. 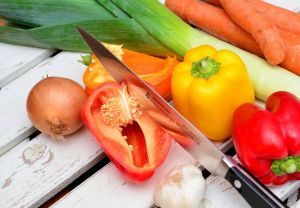 While a completely vegetarian diet is not required to build a healthy eating pattern, you can reduce your cancer risk by choosing a variety of vegetables, fruits, beans, and whole grains while limiting red meat according to the American Institute for Cancer Research’s (AICR) Guidelines for Cancer Survivors. What does variety look like? Start with at least 5 servings of colorful fruits and vegetables each day, add beans and choices of grains with at least half as whole grains and then build on other factors. Plant-based eating can include all plant forms: fresh, canned, frozen, dried items, or juices. Hit all the colorful vegetable subgroups—dark green, red, orange, legumes (beans), and starch. According to the most recent Dietary Guidelines for Americans, half of your fruit intake should come from whole fruit, not just fruit juices. A simple guide is your dinner plate. AICR suggests that 2/3 of your plate be filled with vegetables, fruits, legumes and whole grains—a great place to start! If you were already a vegetarian when you received a cancer diagnosis, then you may choose to continue being a vegetarian, taking extra care to balance your intake during treatment. If you are considering becoming a vegetarian after a cancer diagnosis, be sure to discuss this desire with your healthcare team before changing your diet or lifestyle. During cancer treatment may not be the best time to embark on a total lifestyle change. Why? You may not feel strong enough to learn about this diet. Your body may not be able to digest large amounts of fiber. Vegetarian food sources for key nutrients—calcium, zinc, protein, iron, vitamin B12, and vitamin D—may not taste good to you, especially during cancer treatment since change in taste and smell is a common side effect. Once you’ve considered your options, if you are committed to the vegetarian lifestyle, do it safely and with zest! Be informed of your food choices. Is the internet a good source for food information? It can be if you stick to only evidenced-based resources such as the Academy of Nutrition and Dietetics (AND) or the American Institute for Cancer Research. Food safety is also vital! Practice proper fruit and veggie washing and avoid high-risk food choices like unpasteurized juices and soft cheeses. Flexitarian: a semi-vegetarian diet with a focus on vegetarian foods with occasional meat, poultry, or fish intake. Pescetarian (pescatarian or pesco-vegetarian): a primarily vegetarian diet that excludes meat and poultry but includes fish, eggs, and dairy products. Lacto-ovovegetarian: a vegetarian diet that excludes meat, poultry and fish but includes eggs and dairy products. Most Americans that follow a vegetarian pattern are in this type. Lactovegetarians: a vegetarian diet that excludes meat, poultry, fish and eggs but includes dairy products. Strict vegetarian or vegan: a vegetarian diet that excludes all animal products such as meat, poultry, fish, eggs, milk, cheese and other dairy products. This is type of vegetarian eating requires the most pre-planning to stay well-nourished during cancer treatment. The Choose My Plate campaign by the United States Department of Agriculture (USDA) has great planning tools to help anyone learn about vegetarian meal planning. Not all proteins are created equal so planning your meals and snacks are key to staying strong and well-nourished during cancer treatment. Think about what foods you typically eat now and the foods you like the most. Next, make a list of those foods that fit into a vegetarian meal plan. Imagine how these vegetarian-friendly foods can go with what you are already eating. For example, take a carbohydrate dish like pasta, rice, or oats and stir in your flavor favorite beans, veggies, or nuts. Top with cheese or yogurt. Fill 2/3 of your plate with vegetables, fruits, whole grains, or beans and eat 1/3 or less animal protein as recommended by the American Institute of Cancer Research. If going without meat is not your goal, just eat less meat especially less processed, smoked, and red meat. It is recommended that you eat less than 18 ounces of red meat per week. When eating out or in a group setting, ask for dishes to be prepared without meat. Most restaurants or chefs can swap or substitute beans, tofu, cheese, hard-boiled eggs, or fish for meat or poultry. Or, choose a vegetarian or vegan restaurant, which are becoming more popular. If cooked vegetables aren’t your favorite, try including raw, sliced veggies with humus or yogurt dip at snack time. Or, blend up a smoothie with 1 cup of vegetables, frozen, sliced fruits, and yogurt. The possibilities are only limited by your imagination! Since vitamin B12 is a big concern for vegetarians who choose not to consume dairy or eggs, look for good sources of vitamin B12 such as fortified breakfast cereals, nutritional yeast, soy milk, and meat analogs. Ask your health care team if dietary supplements are right for you if you cannot consistently include these fortified products. Since side effects of treatment or dietary restrictions may occur, ask for help from a registered dietitian nutritionist at your cancer treatment center. If you are becoming a vegetarian, be the best one you can be while on your cancer journey! My PearlPoint’s Protein: How Much Is Enough?